Total Score: 8.29 - BEST VALUE AWARD! Introduction: Abu Garcia has worked hard in recent years delivering stylish, high performing fishing rods at value prices. 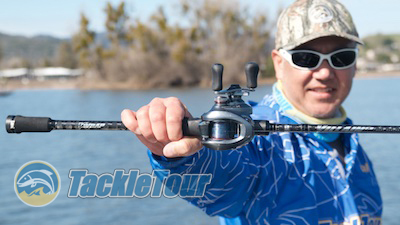 Today, we take a look at a series of rods from this manufacturer that sits near the top of their product offering. 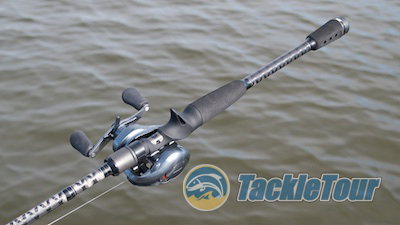 Reintroduced at ICAST 2015, Villain 2 features a blank made from 40 ton graphite all in a rod for only $199! Here's our review of the Villain 2 VC70-6. Quality/Construction: Abu Garcia's Villain 2 VC70-6 is a seven foot (7'-0") rod built on a blank rolled from 40 ton graphite. 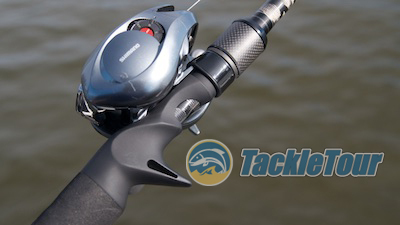 This material is among the highest grade graphite used in the fishing industry. The manufacturer goes a step further and wraps the blank in a familiar cross weave pattern seen on a lot of JDM brands and finishes the entire blank with a thin, glossy clear coat. Introducing the re-imaged Abu Villain 2 VC70-6. The rod features a split rear grip made of EVA foam and no foregrip other than a decorative reel seat locking mechanism. Looking down the length of the rod we can see perfectly aligned guides, but the very tip of the rod has an ever so slight bend off to the right. Epoxy around the threadwraps is generous but clean. 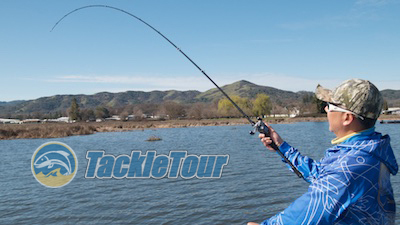 Performance: I matched our Villain 2 VC70-6 with a Shimano Chronarch CI4+ spooled with PLine Original Copolymer line and brought the combo along to Clear Lake, CA for some testing. Matched with a Shimano Chronarch CI4+ and ready for some action. Casting: The VC70-6 comes with a lure rating of between one quarter ounce and one full ounce (1/4oz - 1oz) and handles baits within this range and a little bit over just fine. It has an overall feel of a rod slightly more powerful than your traditional "medium heavy" sticks, so fishing lure weights up to about one and a half ounces (1-1/2oz), though not recommended if you want to stay within warranty, is easily accomplished. It is equally adept at casting and pitching though for some reason, I really enjoyed pitching with this stick more so than I did casting. I think it was the pairing of the VC70-6 with a Shimano Chronarch CI4+ that made for an excellent pitching combination. ... and a cross weave carbon overlay reminiscent of JDM sticks. Sensitivity: My favorite aspect of this stick is its sensitivity. 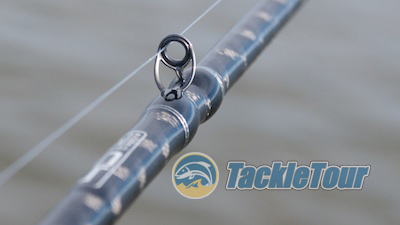 The combination of blank material together with the minimal build and smallish micro or semi-micro guides really make for a lively overall rod. 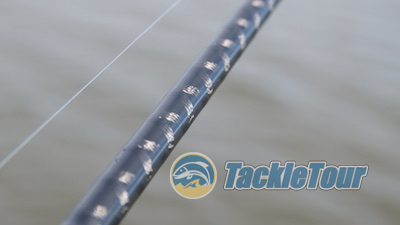 Even fishing with nylon monofilament, it was easy to stay connected with my lure and know what was going on at the end of my line. I was honestly surprised at the VC70-6's sensitivity given its price point. Checking out the rod's power and taper out on the water. Power: It's reassuring when you get an impression from a rod out on the water and then later, back that impression up when you go back to analyze its lab data. Looking at the VC70-6's RoD Deflection chart below, you can see how the stick's power curve is more shallow than that of our 2010, The Search for One baseline rods. Meaning the impression I got out on the water that this stick is a little more powerful than a typical "medium heavy" was not just my imagination. Fig 1 : The chart above illustrates the deflection characteristics of our Abu Garcia Villain 2 VC70-6 against our 2010, The Search for One baseline rods. The shallower curve means it deflects less than the other two rods when under the same load hence the rod is more powerful. So actually, the VC70-6 is probably closer to our old G.Loomis MBR844C GLX than it is to our MBR843C or MBR783C. In fact, the rod's line and lure rating would also attest to this discovery. Therefore our confusion stems from the simple power rating on the rod of "medium heavy". It's no wonder I enjoyed pitching with this stick more than I did casting. The MBR844C GLX was my pitching stick of choice at one point in time. A look at the rod's titanium framed, zirconium insert micro guides.